The opening of the hit musical Hamilton at the Durham Performing Arts Center has meant letters we have from Alexander Hamilton, Aaron Burr, and other figures in the musical have been getting some attention on campus, in the press, and in our reading room. We’re always excited to share our collections, especially when they relate to a musical that grapples with questions of whose voices are included in history and how historical narratives are constructed. Want to hold and read a letter that Hamilton or Burr wrote? These collections are available in our reading room and open to all, so come visit us. 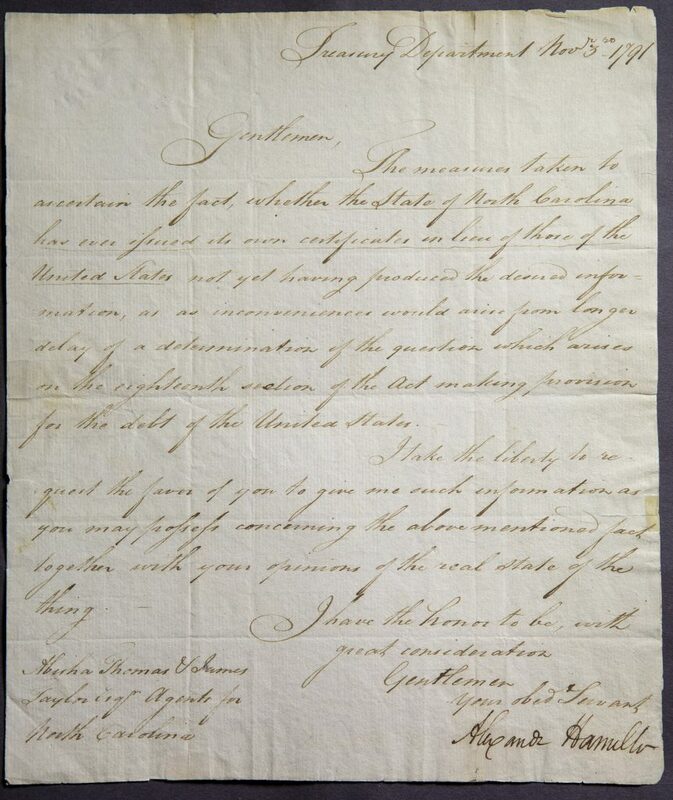 In November 1791, Hamilton, then Secretary of the Treasury, wrote to Abisha Thomas and James Taylor, treasury agents for North Carolina, trying to find out if North Carolina had ever issued its own debt certificate in exchange for those of the United States. This may seem like one of the more technical provisions in the Funding Act of 1790 (which Jefferson complains in the musical has “too many damn pages for any man to understand”), but it relates to one of the most important pieces of Hamilton’s financial plan for the new nation: the federal government’s assumption of debts incurred by individual states during the Revolutionary War. The vigorous debates that surrounded Hamilton’s economic vision for the US were re-imagined in Hamilton as a rap battle in “Cabinet Battle #1.” Hamilton, of course, did succeed in getting congressional support for his financial system, thanks to the deal he made with Thomas Jefferson and James Madison in the Compromise of 1790. The letter was likely written by a clerk (Hamilton was a busy guy! ), but it does bear his signature, just below the closing “Your Obed. Servant.” This was a common closing for letters between elite men in the 18th century. Burr and Hamilton both used it (if not sincerely) during the heated exchange of letters that led to their duel, earning the phrase a prominent spot in the musical. This collection also includes a newspaper clipping of a republished letter, 1780, from Hamilton to Elizabeth Schuyler concerning the Benedict Arnold affair and the death of Major John André. Aaron Burr Letter, 1793, Dec. 24 : Philadelphia, to Mrs. Burr. In this letter, we see side of Burr only hinted at in the musical. Here he’s not Hamilton’s political adversary, but a devoted husband trying to find his wife, Theodosia, relief from her “distressing illness.” Theodosia and Aaron Burr’s relationship gets only a couple of lines in the musical, but as is alluded to, Theodosia was married to a British officer when Burr began courting her during the war. Theodosia and Aaron did eventually marry in 1782, following the death of Theodosia’s first husband. The Burrs’ marriage was one built on affection, friendship, and respect for one another as intellectual equals. Theodosia had been ill for much of their life together and by 1793 was in severe pain. Aaron Burr writes this letter to Theodosia from Philadelphia, where he was serving in Congress, on Christmas Eve, 1793 to say he had consulted with Dr. Benjamin Rush, the prominent Philadelphia physician, and Rush advised she take hemlock. Burr had not told Rush Theodosia was already taking hemlock and is pleased that Rush’s opinion aligned with the medical advice they’d already received. He closes his letter saying he hopes the hemlock “may restore you health and to your affectionate, A. Burr. ” Sadly, Theodosia was likely suffering from cancer, and died just five months after this letter. 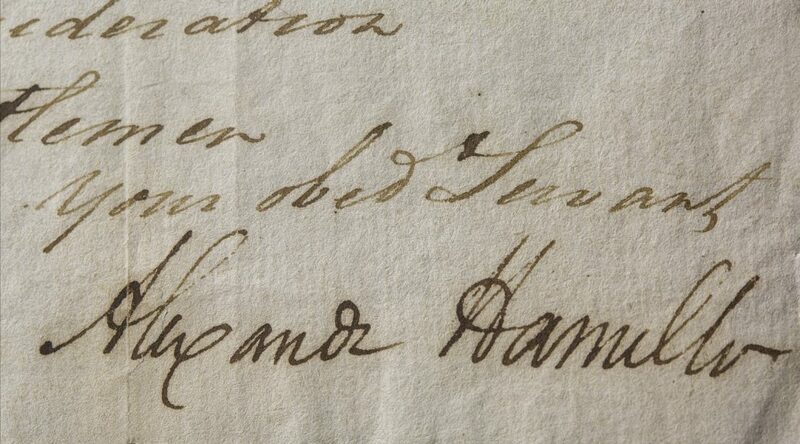 Hamilton wrote this letter to Harrison Otis, another prominent lawyer and Federalist, advising on whether a particular document would be admissible as evidence in an ongoing lawsuit related to an insurance claim following the seizure of a trade ship by the Portuguese off the coast of Brazil. Otis was one of the lawyer’s representing Hamilton’s brother-in-law, John B. Church (with whom Burr had previously dueled! ), in the case. Following his duel with Hamilton and the end of his term as Vice President, Burr went on a seven month trip through the western states and territories, making his was all the way down to New Orleans. 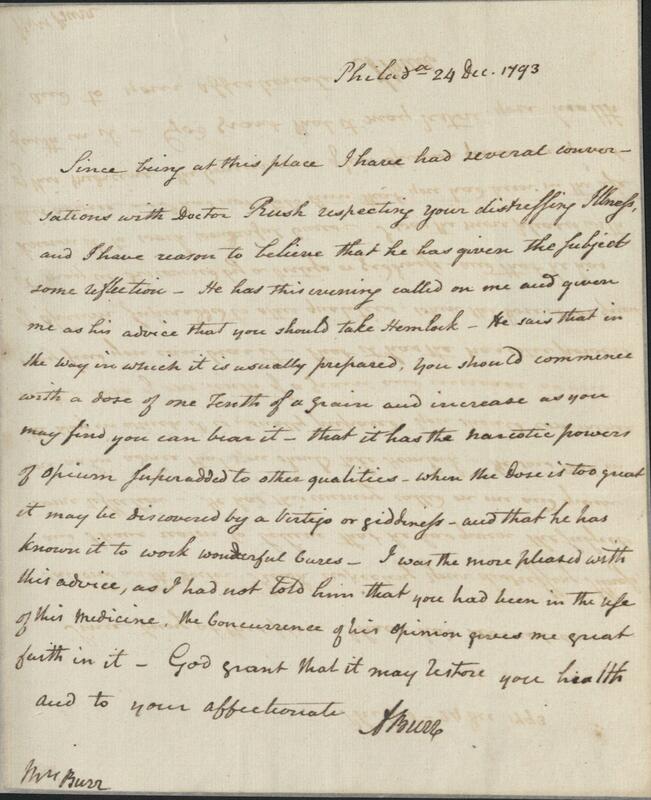 Van Ness served as Burr’s second in his duel with Hamilton, and as this letter shows, Burr continued to rely on Van Ness. Burr writes Van Ness from Chillicothe, Ohio, the state’s capital at the time, asking Van Ness to meet him in Berkeley Springs, Virginia (now West Virginia) “as soon as may be possible (I don’t say convenient),” and instructing Van Ness to contact some of his supporters: the physician and editor “Dr. I” (Dr. Peter Irving) in New York, and the Philadelphia merchant Charles Biddle. Burr also mentions plans to meet his daughter Theodosia Burr Alston and son-in-law “Mr. A” at the Springs on November 4th. Includes an August 17, 1777 letter from John Laurens to his father asking for a few books on military theory to be sent to him. He asks his father “to direct the Parcel, as my name is not known, to Colonel Hamilton aid de camp to Genl. Washington.” Laurens’ name was probably not known as he had only begun serving as a volunteer aide-de-camp to Washington eight days before this letter was written. Hamilton was one of his fellow aides-de-camp, and the two became close friends and remained so until Laurens’ death in 1782. Schuyler, Philip J. Letter, 1801, May 2 : Albany, to Thomas Barclay, Esq. Philip Schuyler was Hamilton’s father-in-law and served as one of New York’s senators in the First United States Congress. A Federalist, Schuyler lost his re-election to Aaron Burr, who ran as a Democratic-Republican, in 1791. Schuyler regained his senate seat from Burr in 1797, before resigning the next year due to poor health. In this letter, Schuyler, a chronic sufferer of gout, gives his case history and writes of Samuel Stringer’s prescribed treatment against gout, the inhalation of oxygen. Goebel, Julius, Jr., ed. The Law Practice of Alexander Hamilton; Documents and Commentary. New York: Columbia University Press, 1964. Nancy Isenberg. Fallen Father: A Life of Aaron Burr. New York: Viking, 2007.